Don’t pay attention to images you see on demos. Just imagine how would your website look if you change images, colors, typography and you would see that Floris theme fit to what you need. Despite Floris come with all necessary free and commercial plugins, you can always enhance it with other specific plugins you may need. In our demo you would see perfumery, fashion, accessories, man, woman, kids demo products, it is just small sample of where you could use Floris. We’re sure if you use Floris one time, you would like to get another license for your next project, because it’s powerful and yet intuitive. Admin panel features allow you quickly to craft any e-commerce website. Another word Floris is multipurpose & multi-concept WordPress theme designed and coded with upcoming 2017 year’s trends/standards. Stand out from your competitors with this sleek, trendy theme! 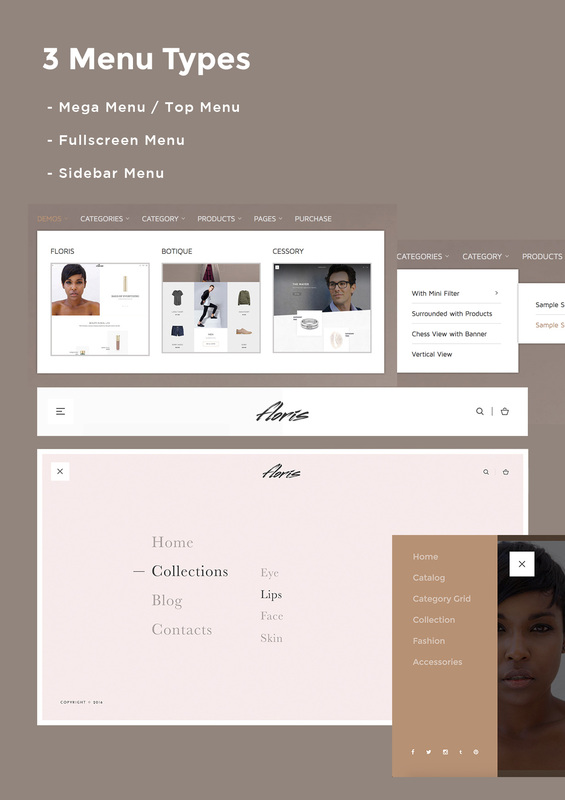 Floris is a minimalist responsive WooCommerce theme specifically designed to adapt its display according to the device in use. It’s packed with great features you can customize according to your brand. We regulary release new update with new features and plugins, improvements, fixes. You will get all them for free for unlimited lifetime access. The ultimate MailChimp WordPress plugin allow you easily build unlimited forms for your MailChimp lists, add them to your site and track subscriber activity. Attract your visitors with Instagram images on footer. Let them subscribe to your account. We added this option to visual composer as shortcode. We included 15 HTML template files of the theme in case you need to integrate into your own CMS. Our Theme Options panel allow you to add any social network account in footer and any for product page to share. We forecast that minimal design will remain on trend for at least next 5 years. Design is first always, look aroung to other themes and sites, you would notice most of them are like from incubator. Do you want to message your customers that your business is creative unlike others, and you pay attention to everything including to your website design because you are stylish? You website visitors would definetly remember your website because of it’s design. Floris theme design will attract additional traffic to your website just because of it’s look and feel, visitors definitely would like to return to your website. People love to see nice interface. A minimalist yet completed WooCommerce theme with a strong focus into the details, built on top of Assembly. Floris come with Visual Composer drag and drop page builder, through which you can create impressive page layouts, it allows any single element in every page to be re-arranged and re-sized at your will. 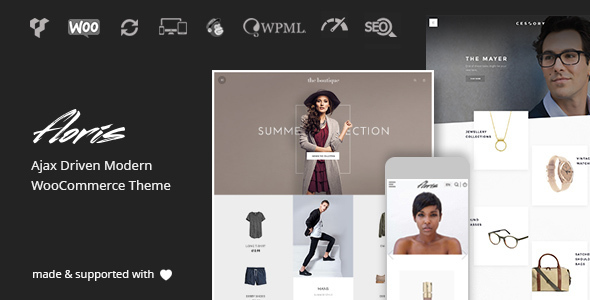 There is “Massive Addon” plugin which double enhance visual composer capabilities. Florisx is WPML compatiable, this plugin allow you to translate content of your site to many other languages – German, French, Spanish, Italian, Portuguese, Chinese, Hindi, Arabic, Turkish, Russian, Dutch, Japanese and others. * Draft category product load on ajax issue fixed. * Multiple images in product thumbnails fix for WooCommerce plugin. * Fix double order detail in WooCommerce thank you page. * Category link issue solved. * Updated WPBakery Page Builder for WordPress (Visual Composer) to version 5.4.5. + Added settings for slider settings. * Overall improvements on cart, checkout, pages.